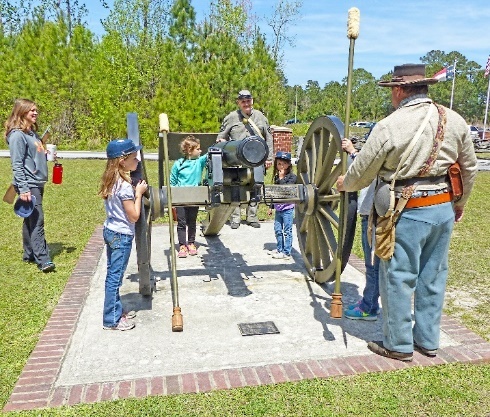 The popular Harry Goodman Battlefield Adventure Day for children is Saturday, March 24 at New Bern Battlefield Park. A day full of learning activities, period games and living history, it is held annually at the park, which has been recently upgraded by the New Bern Historical Society. The event is for boys and girls ages 6-12 years old and an adult. Check-in begins at 11:30 a.m. with activities from noon to 4:00 p.m.
Young recruits and their parents will be greeted by re-enactors from the 5th N.C. Regiment, the 7th N.C. Regiment and artillery from McCullough Living History. The newly “enlisted” recruits can choose to participate in practice drills or Civil War period activities and crafts. They will also take part in Civil War era games. Historical Society battlefield guides will provide an informative and entertaining walking tour of the battlefield. A commissary lunch, provided by Moore’s Olde Tyme Barbeque will be served to each young recruit and adult. After lunch, the day’s activities will conclude with a battle re-enactment that includes the children. Cost is $10 for one child with accompanying adult, plus $5 for each additional child or adult, with a $20 maximum for a family. Special price for active duty military and families qualifying for free/reduced school lunch program. For more information or to register, call New Bern Historical Society at 252-638-8558 or go register online.